These premium pacifier clips help your baby remain happy and healthy by keeping their pacifier within their reach at all times, preventing it from falling on the ground and getting dirty. 7 High-quality, unisex pacifier clips suitable for both boys and girls. The ribbon is double-layered for extra durability, and you’re guaranteed to have a clip that goes perfect with any outfit! This unique clip design not only holds onto clothes much more strongly, but is less likely to break and present any hazard to your child. These clips hold twice as much weight vs. the leading plastic clips, while being safer at the same time! Multifunctional. 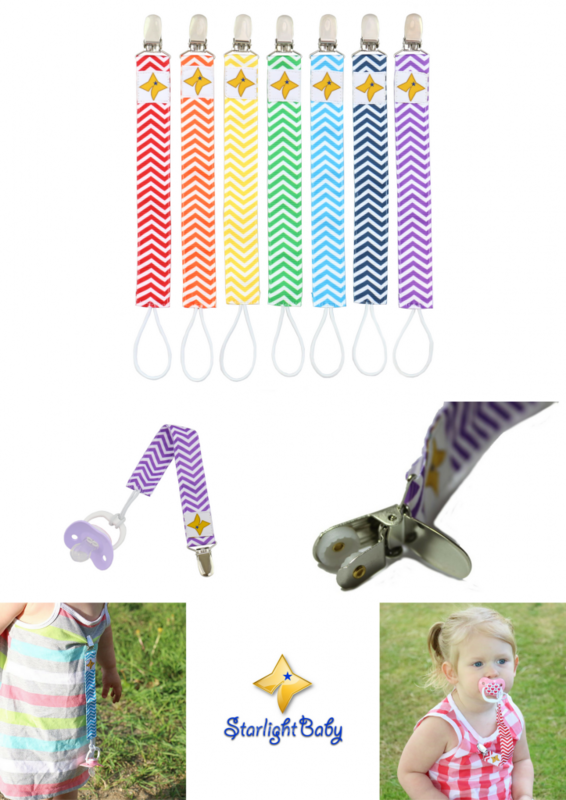 All Starlight Baby pacifier clips work perfect with all pacifiers, teethers, bibs, blankets, and small toys! 100% SATISFACTION GUARANTEED We believe so strongly that you will love our pacifier clips that we offer a 100% money back guarantee with every purchase. If for any reason you aren’t satisfied with our pacifier clips, we will refund your entire purchase (including shipping) with no questions asked. Click here to purchase on Amazon.com for $14.99!